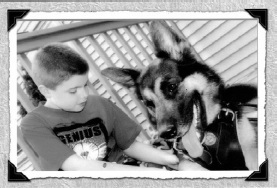 In an earlier issue, we introduced you to a friend who is autistic and was waiting for his service dog to be trained to his needs. Well, as you can see his new best friend has arrived and they look forward to all their new adventures together. Although the process took longer than expected, "Lena" is a perfect fit and temperament. These friends spend their days together in school and come home for some play and relaxation time. 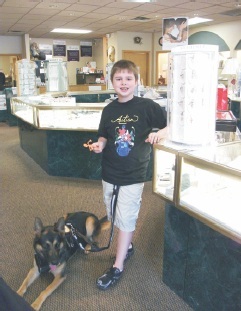 On behalf of our staff and this special family, we would like to extend a thank you to all who helped by buying a raffle ticket or with a donation to the training facility for this type of service dog. It really does "take a village" to raise a child and have a positive affect on his or her life. I wonder if Santa will bring be bringing Lena an extra big bone for her first Christmas here!